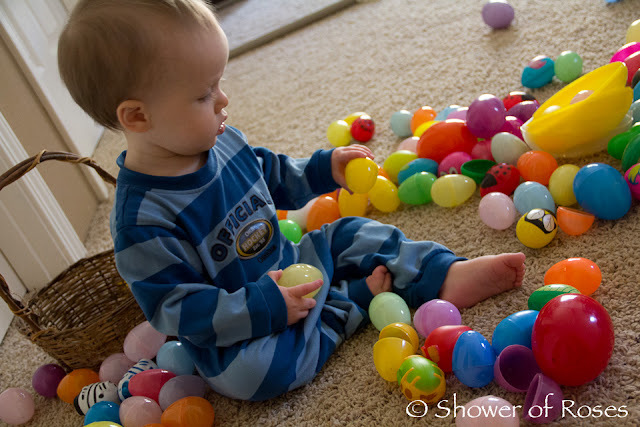 Lots of pretty Easter Eggs, even if they are plastic! 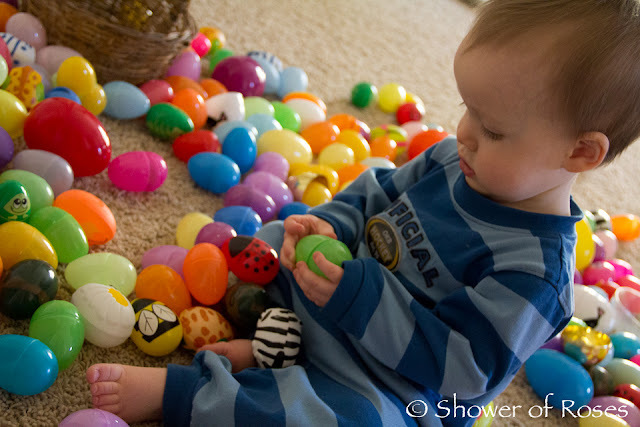 Bud enjoyed helping me fill them the weekend before Easter, just before we headed over to the coast, when I probably should have been getting our Easter clothes together. At least the Eggs were all ready for our Easter Sunday Egg Hunt! 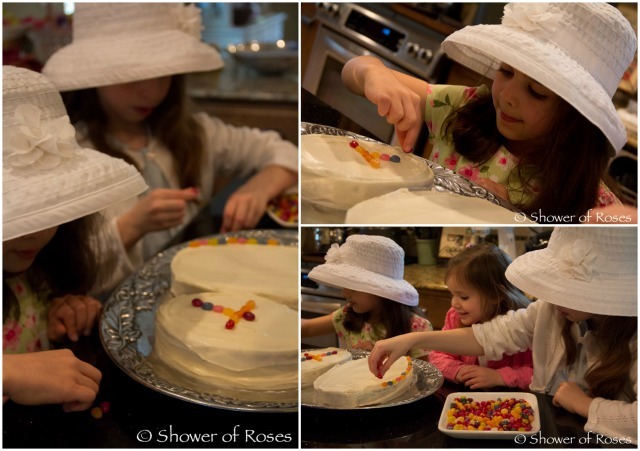 Rose was very happy to get to help the girls decorate our oval "Easter Egg Cakes" this year! I can't even tell you how many times the kids all walked past the egg on St. Francis' statue! How do you like my Cheese Pascha Blob? Um... yeah... it didn't really turn out like I had hoped! It was absolutely delicious though, so we will be giving it another shot next year. At least our (first attempt) Paska turned out beautifully! I posted the recipe at Catholic Cuisine. We also had an earthquake here just after 5:30pm (Wednesday). It wasn't very strong but we all felt it as it shook the house... I really hope that doesn't happen again! My friends' pascha looked like yours. It was not sweet and we ate with bread and sausage. They are Byzantine, so it was fun to celebrate with them. Oh my, earthquakes are scary. Since living in Alaska, I've become very aware of even the smallest shake 1 to 3.5 to of course the bigger ones. There are, I kid not, 50 to 100 earthquakes daily in AK! Your bread looks amazing! I have been catching up on all your posts since Palm Sunday (I took holy week off and look what I missed!). What an amazing celebration you had at the beach, and your children's passion in miniature toys is amazing. Such beautiful children and such a beautiful mother. Your joy just radiates. I love visiting you here. You remind me to hug and enjoy my children, and to SMILE! Thank you Jeannine! Happy Easter to you too! Love the pictures of your family. We had a Easter egg hunt too. We had to hide ours inside because of rain. Happy Easter. I'm sure we would have resorted to hiding them inside if we had to, and the kids probably would have loved it just as much as always! Looks like a wonderful Easter! 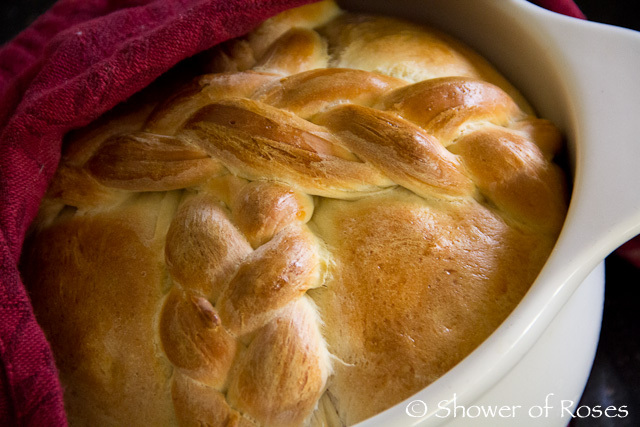 I love the braided bread. I've made the sweet cheese (pashka) using several different recipes that called for cottage cheese, ricotta cheese, etc. It always seems to come out best if you can find tvorog cheese, which is sometimes called "farmers cheese" here. It is the cheese they use in Russia. And it requires 'lots of time to drain all the liquid -- sometimes up to 4 days! It creates the XB symbol on one side, a cross on the other, etc. Blessings to you during this Eastertide! Thanks for the links! I will have to try making the Russian version next! I've seen the molds before, and might have to consider ordering one, since we all liked the pascha very much! I love that you incorporate it into your daughter's "gotcha day!" So sweet! Wow! I was on the other side of the valley at flute class so I didn't feel anything! Crazy! 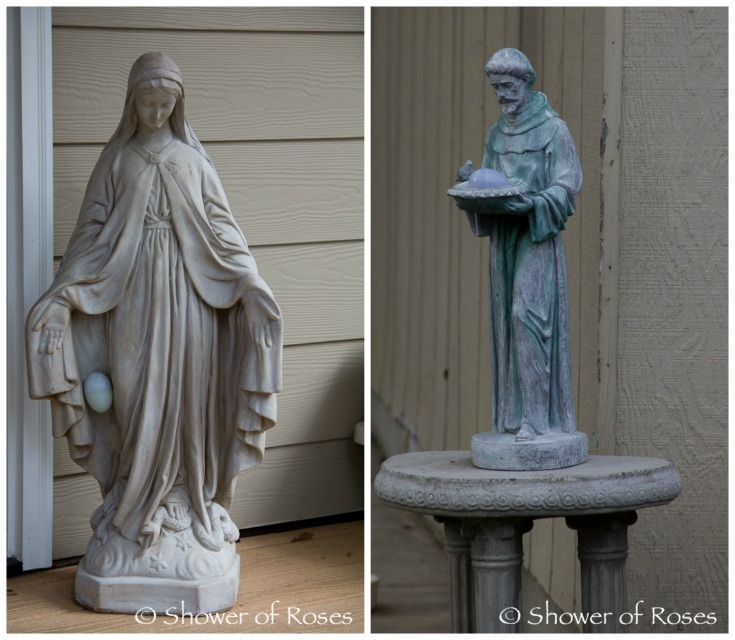 We also had Saint Francis cradling an egg and the kids walked right past it a few times. You would think they would know by now! Yes - the center was less than a mile down the road from us... not nice. On a side note, I just got the cathedral cake pan for Easter and I was wondering how you make your cake mixes not stick to the pan? 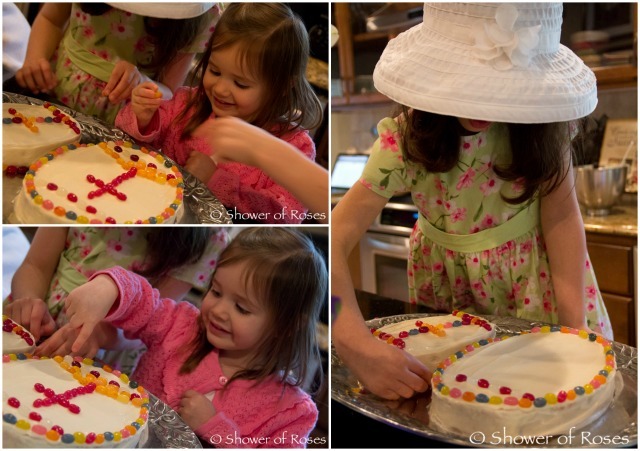 I've always had so much trouble with cake pans that have a design. God Bless! I'm sorry it's taken me so long to get back to your question! I always use a Baking Spray (either Pam or Wilton) on the pans first and I've never had any trouble. I hope that helps! Wonderful family photos. 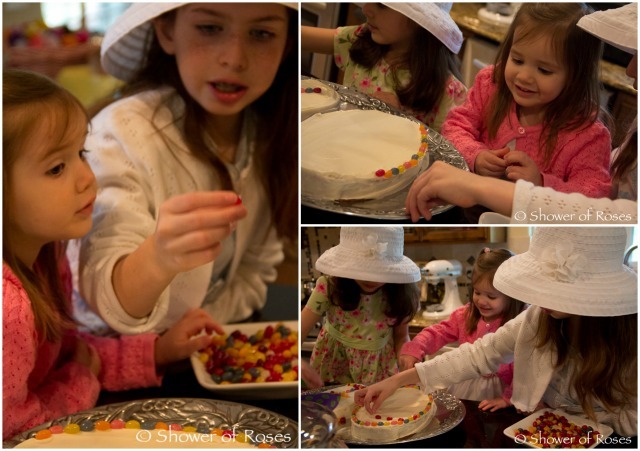 So many helpers to decorate the Easter Egg cake. I love it. 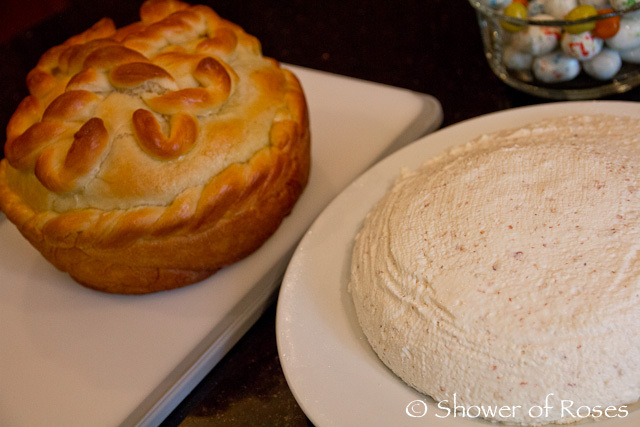 I am determined to bake Pascha Bread next year. I have all been quite intimidated by it but it is past time to try. Happy, Happy Easter! !